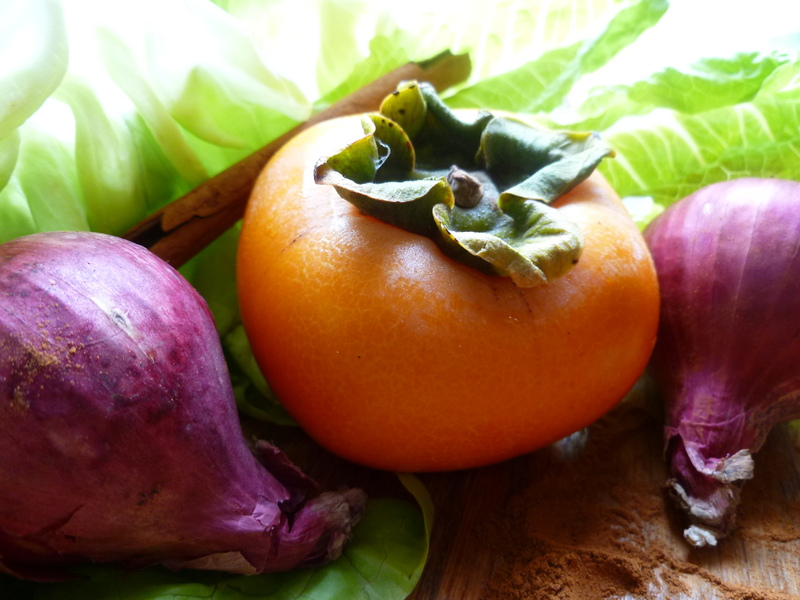 Persimmons look like and are an autumnal fruit. 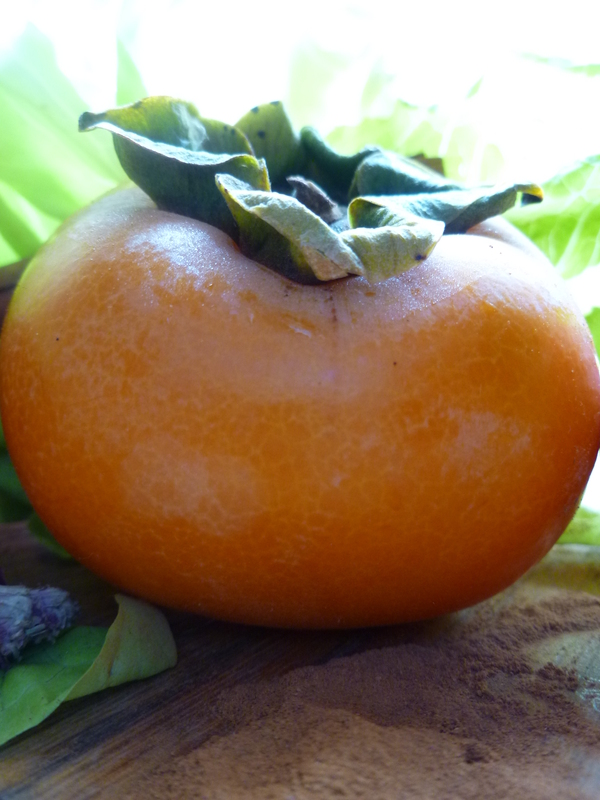 The persimmon season begins in September and doesn’t end until well into the winter. The fruit clings on the tree long after the branches are bare. Lowering temperatures help ripen it—softening the flesh and turning the orange skin a shade deeper. Here are two salads that combine them with other pleasant associations of the season–nuts, dates, cinnamon, Port wine, purple shallots roasted crisp, and the last of the basil in the garden. Persimmons… slow and late to turn sweet and good to eat…This quality has made them a visual metaphor for a man’s character, which in youth, like the sour, inedible young fruit, is still unformed and not very useful…but which, in maturity, after a long season of growth, is full of the sweetness of wisdom and experience of age. 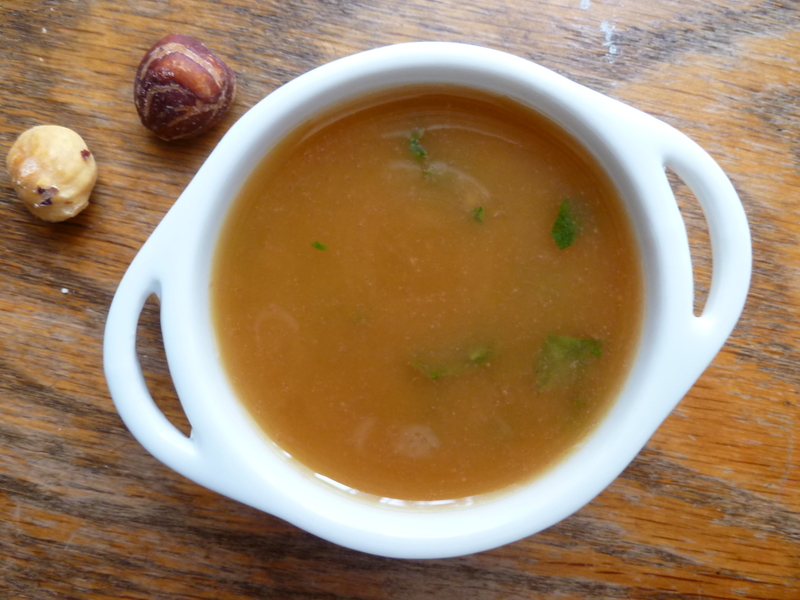 Variation ~ I ~ combines persimmons with lettuces, hazelnuts, and fresh dates in a Port Wine Vinaigrette. The salad is loosely based on one from The Culinary Institute of America’s An American Bounty, a collection of recipes from the Insitute’s restaurant by the same name. 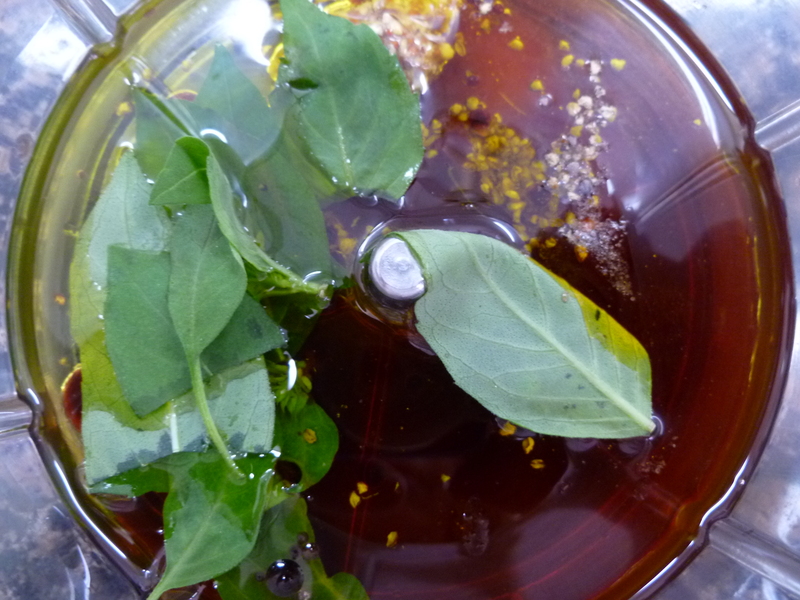 The vinaigrette is from the same source. 1. 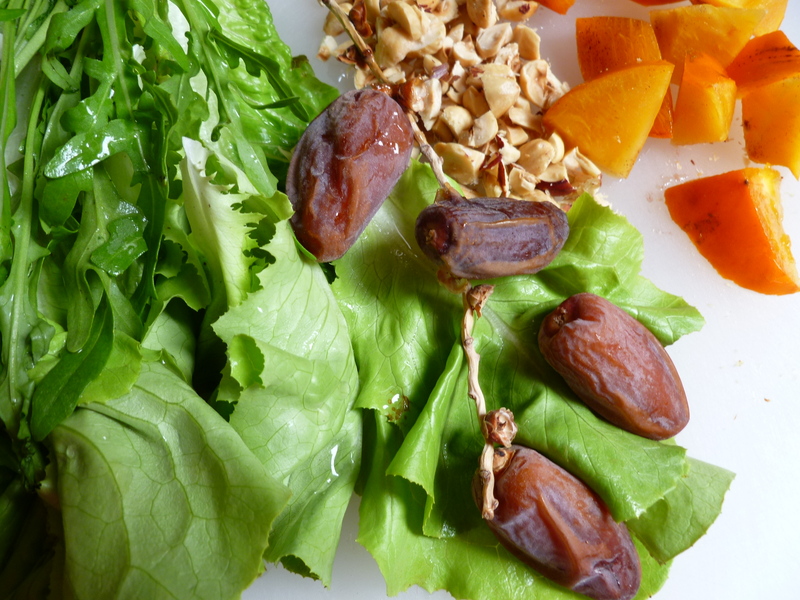 Combine the lettuces, hazelnuts, persimmons, and dates in a large bowl. 2. Toss with Port Wine Vinaigrette just before putting the salad on plates. 3. 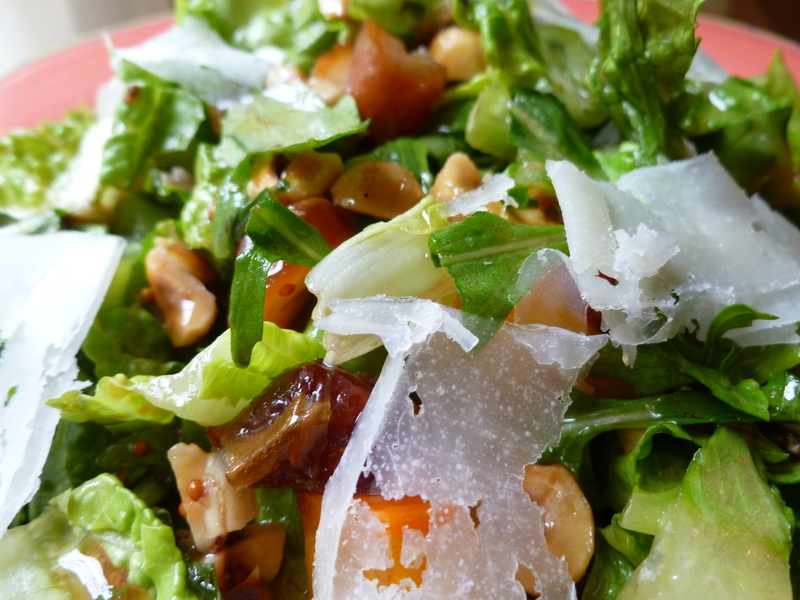 Scatter shavings of Manchego cheese over each salad. 2. 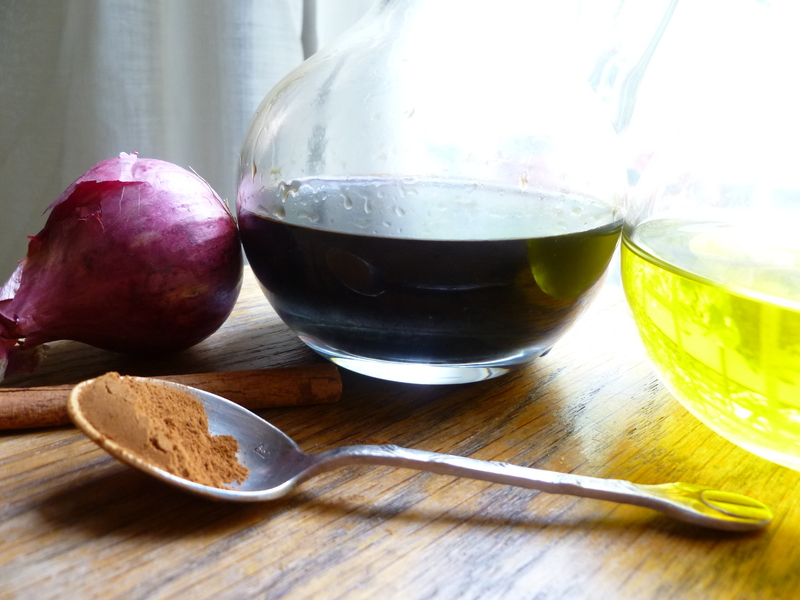 If you don’t want to use the vinaigrette right away, refrigerate it. Bring it back to room temperature before you use it. 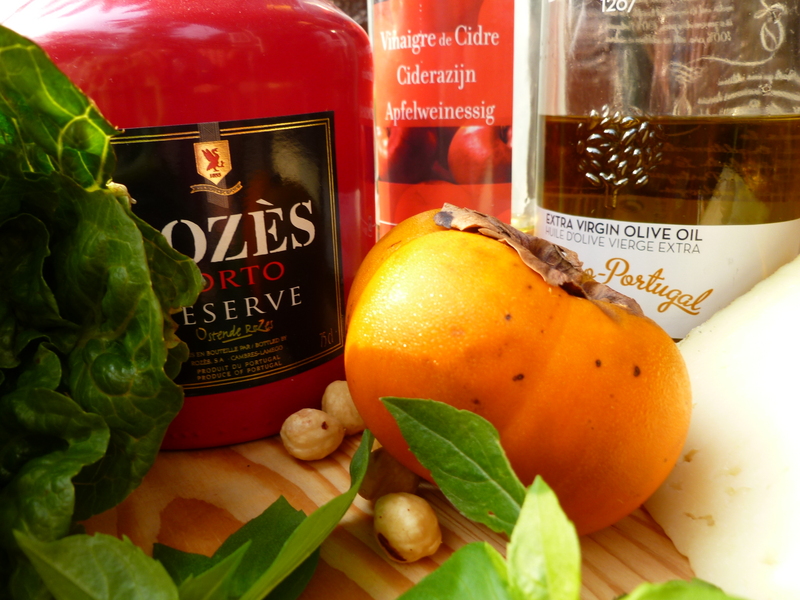 Port Wine Vinaigrette may be stored cold for many weeks. Variation ~ II ~ spices fresh greens with cinnamon. The source of this recipe is Yotam Ottolenghi, a native of Israel who has become a successful London chef and restauratuer. Mr. Ottolenghi writes a weekly column, The New Vegetarian, in The Guardian. The column is not, despite its title, solely vegetarian, but it does combine foods in new and innovative ways. 1. Preheat the oven to 400 F. Cut the shallots in thin slices, mix them with a little olive oil and spread them on a baking sheet. Grind some fresh pepper over them and roast them about 12 – 15 minutes, or until they are golden. Put them aside to cool. 2. 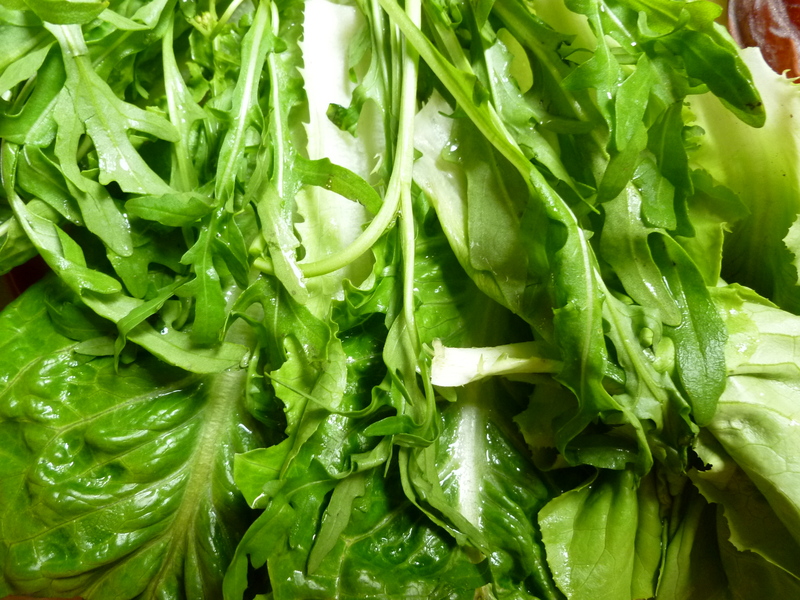 In a large bowl, combine the lettuces and the basil leaves. 3. Just before serving, mix the vinaigrette with the greens and divide the greens among the salad plates. Sprinkle some roast shallots over each plate of lettuce, then some pecans. 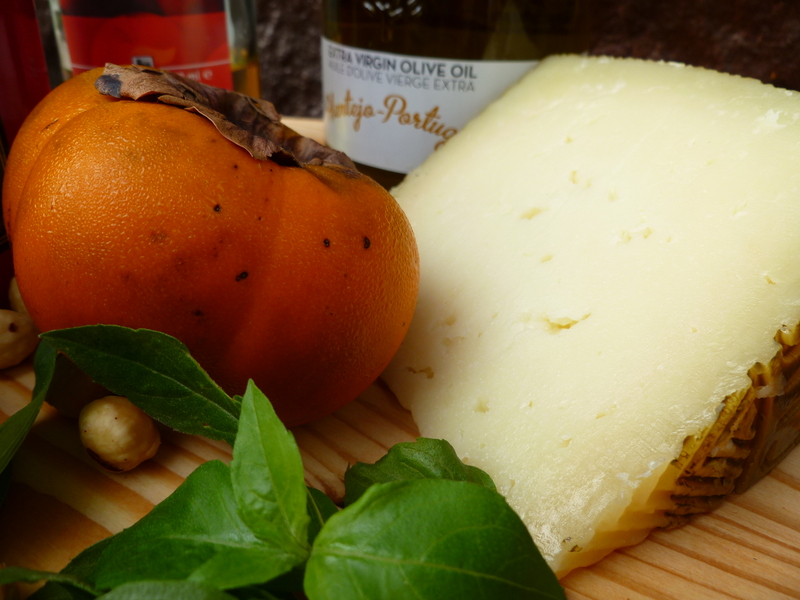 Arrange a few slices of persimmon on each salad and finish by scattering shavings of Manchego on them. 1. Whisk all the ingredients together and mix the vinaigrette with the greens and basil leaves right before arranging the salads on plates. 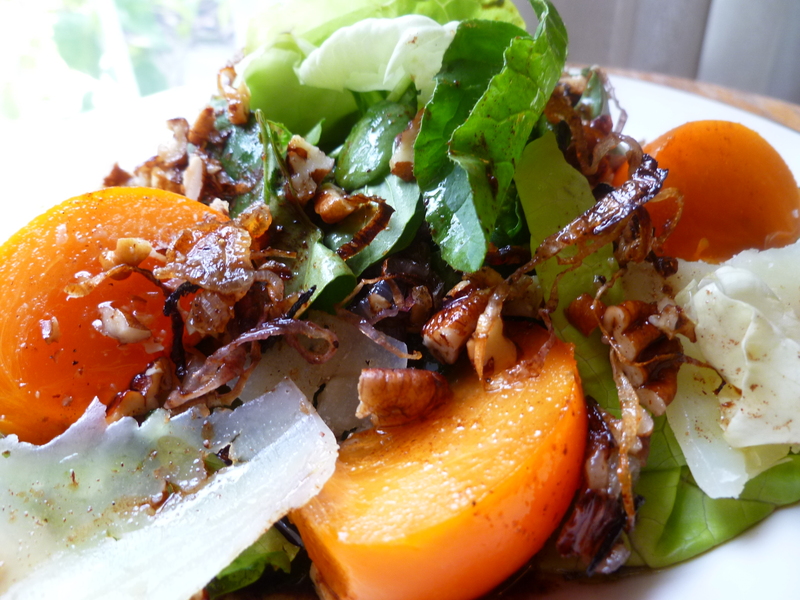 A Note: Autumn Salad: Persimmon Variation II is the salad course for the Dinner Menu: A Welcome Dinner for an Out-of-Town Visitor who has Traveled Far.